Meeting point : Lonavala Railway Station at 1am. Dinner and Stay at Sawle or Padarwadi depend on trek speed. Note : OffBeat Sahyadri is not taking care of your travel till Lonavala. Or Bus : – Any bus for Pune going via Lonavla. Make sure one reaches on time, waiting for any latecomer will not be possible as tight trek schedule does not allow for any wastage of time. Ø Prior Trekking experience is mandatory. Ø Wear comfortable cotton clothing, carry sufficient warm cloths and proper bedding as it might be too cold atop at night. Ø Keep the baggage light, Please do not carry sling bags or Jholas. Carry proper bag pack, with all the zips working and no damaged strands. 2. 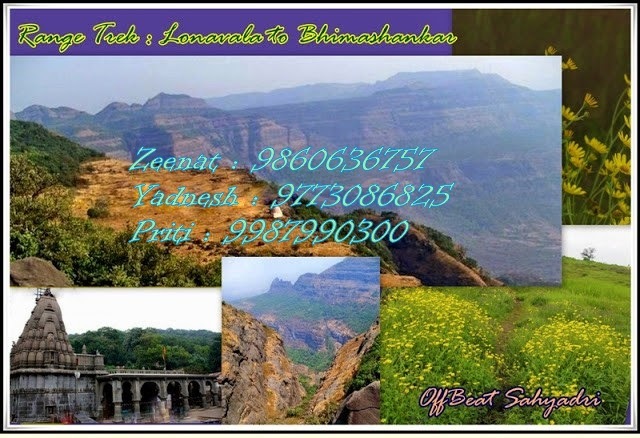 Offbeat Sahyadri believe in being one with nature and that is possible only when we shed all city slicker attitudes. Of course by that we do not suggest that one should be ready for any kind of nonsense. 3. Utmost care is taken to ensure safety of the group and care is taken that no one is inconvenienced because of factors within our control. 4. We do expect our offbeater friends to understand group dynamics and leave at home their individuality. They should be prepared to share and care. That makes and all the physical and mental exhaustion forgettable and the trek itself becomes unforgettable! Trust us on this. 1. Absofreakinglutely no littering! Carry your own trash. If you are found littering then we will request you to pick it up. Friends, it is really not nice to throw garbage around and it only reflects upon us. Will we do this to our own houses? 2. Do not disturb the flora and fauna. No making pretty bouquets of grabbed flowers and blooms. No feeding and intimidating birds and other animals. Think how you would feel if someone barges into your house and threatens you. The jungle is THEIR home. So, Capital NO= NO! 3. Remember, the mountain has a mind of his own. Beware and do not make the mistake of taking him for granted. It sounds weird but it’s true. 1. It is fun to interact and get to know people from different walks of life. Feel free to take the opportunity to expand your social circles. 2. Share water and food. Nothing else is a better ice breaker than being offered water or a bite of your sandwich! 3. Care for your fellow trekkers. It is not nice to be self centered and unamicable. 1. The organizers and you yourself are equally responsible for your safety. We cannot take the blame for injuries or inconveniences arising out of actions outside the organizers instructions and acts of nature. 2. Simply put, stay with the group. Do not rush far too ahead or lag too behind. We understand that everyone has a different stamina and we try to keep the group bound together. 3. Do not wander off from the main trail. Whenever there is no established trail, strictly stay with the group. Be within the sight of the person ahead of you and the one behind you. It helps. 4. One must understand that the group leader is responsible for the entire group and may have to take some tough decisions at times. If one expects a memorable experience with us then we expect full cooperation and discipline. To sum up, the leader’s decision will be final and binding on all offbeaters. 5. Finally, the non arguable part. Smoking and other forms of tobacco use and alcohol consumption is strictly prohibited.